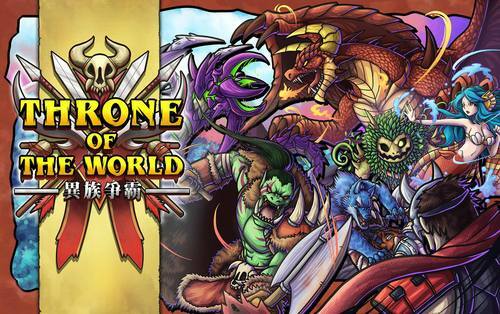 Throne of the World is a set collection card game from a company which I had not heard of before, Good Game Studio. In this game, players take on the role of one of thirteen different races fighting for the Throne of the World. This is one of those games that it is easiest to start at the end and then circle back around. Why? There are four different ways to win the game, and without knowing that from the start, it’s hard to understand what you want to do during the game. To set up the game, each player is given 20 coins and each is dealt 2 Race cards at random and then chooses one to play in this game. Each Race has a pair of special abilities unique to that Race which can be used in the game. The deck of cards (filled with Profession cards, Skill cards and Action cards) is shuffled. Each player is dealt a starting hand and then 5 cards are placed face up on the table in the trading area. The starting player now takes the first turn and play will alternate until anyone can claim victory by meeting one of the four victory conditions. 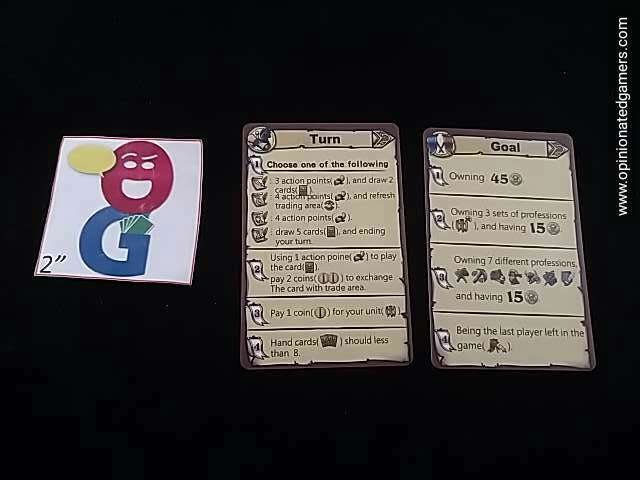 There are 4 phases to each turn, and the choices are nicely condensed onto a review player aid. Recuperate: Draw 5 cards. Your turn ends immediately and you do not do the other three phases. Phase 2: Play cards – you can play cards to the table at the cost of 1 AP per card played. You can also trade cards from your hand for one on the Trade row at the cost of 2AP per card traded. You are not obligated to use all your AP, though you cannot save them for later turns. Profession cards go down on the table. They are always laid with other cards of the same type. Some cards are producers – and they make you money. Some cards are attackers – they can be used to attack your opponent – this damage can either be absorbed by returning played occupation cards from the field or paid for with one coin per damage point. If the opponent cannot remove cards nor pay for the damage, he is eliminated from the game. When you play a profession card, nothing happens other than it being put on the table. 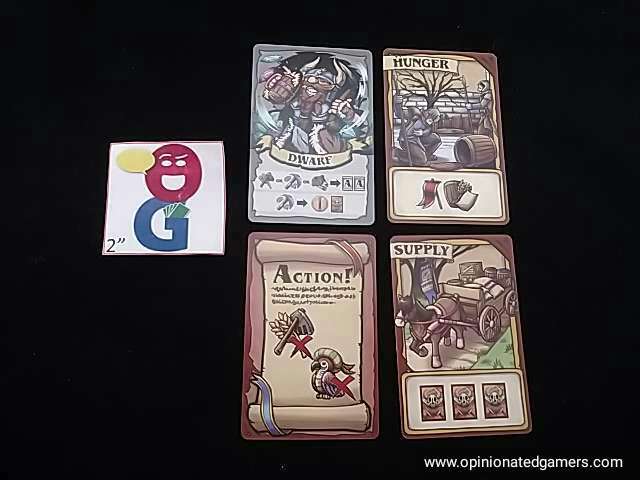 Action cards – these cards are used to trigger the action of the previously played profession cards. There are two types here – one type gives you a choice of possible professions to activate, and you can choose any one type to use; there is also an action card which specifies a specific type of card but allows you to activate them twice. 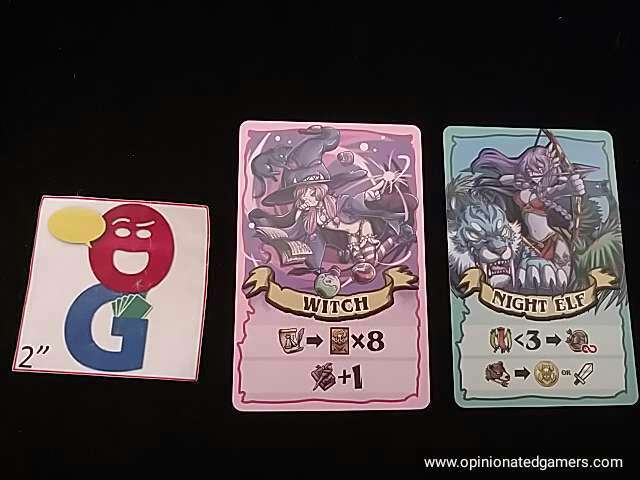 Skill cards have special abilities on them – and they are limited to only one per type per turn. Phase 3: Pay for your units – for each card in the field, i.e. face up on the table in front of you, you must pay 1 coin to the bank. (The rules don’t explicitly state this – but we assumed that you had to discard any cards that you could not pay for). Phase 4: Discard – discard down to 8 cards in your hand. Again, the game ends immediately (even in the middle of a phase) when someone meets one of the four victory conditions. 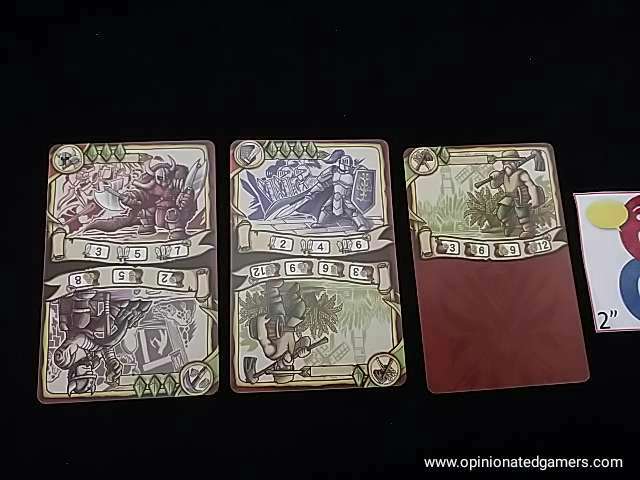 Throne of the World is a quick paces card game which I’ll classify as a set collector, though it’s not in the traditional sense. The reason you want to collect “sets” is that the different occupation cards work better when combined with like cards, but you really aren’t obligated to collect them in sets – they can still be activated as solo cards. The game gives you a number of different ways to win. You could focus on simply producing money as fast as possible. You could choose to play attacking cards and beat your opponent into submission. If you choose to attack, you also get the benefit of slowing their engine down as they will have to either discard profession cards to absorb the damage or they will have to pay their hard earned coins instead. However, as much as you want to plan out your strategy – you’re pretty much a slave to the cards that you are able to draw/trade from the deck. And I like this tactical nature of the game – you try to come up with the best plan you can based on what you get in your hand. The rules are not the best, but we managed to pick it up quickly – and only had to make one house rule about the card upkeep payment. 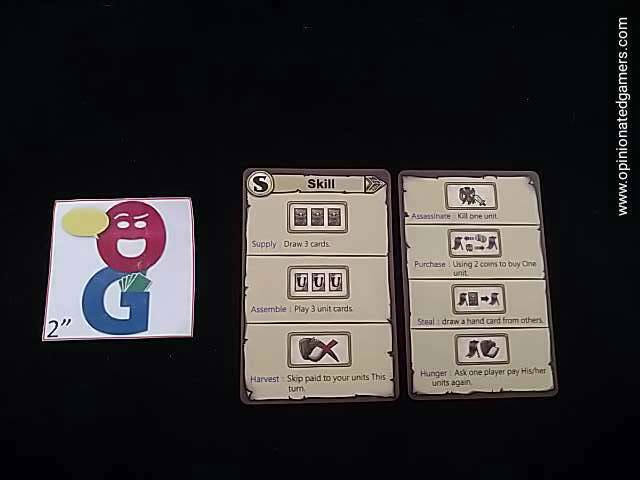 Otherwise, the player aid cards make it quite easy to follow the flow of the game and keep you aware of your possible actions. My son quite liked the artwork on the cards, but I found the layout to be a bit busy. Once you got used to formatting, it was OK – but I would have preferred a cleaner look. Each turn moves along fairly rapidly, though there will be a few turns in each game where I really need to take a minute to survey my options to figure out what the best play will be. But, for the most part, it’s a rapid fire game that you are immediately and constantly involved in. Our first forays in the game have taken about 20 minutes – mostly due to us learning how the cards work and getting used to the flow of the game, but I can actually see this taking closer to 10 minutes if both players are familiar with the game. While 2p games are not usually played here that much, this one has been liked enough to remain in the game room. As the games are short, this is something that we’ll probably pull out in small breaks of time over the summer.